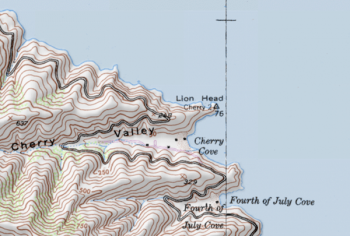 Cherry Valley, Santa Catalina Island is shown on a map in The Islander on August 1, 1916. It is named for the native cherry trees, Prunus ilicfolia, which grow there. CHERRY VALLEY: “A beautifully wooded valley running straight up, through a luxuriant cherry grove, into the hills. The mouth is a fine and rich bottom ending at a narrow, pebbly beach. 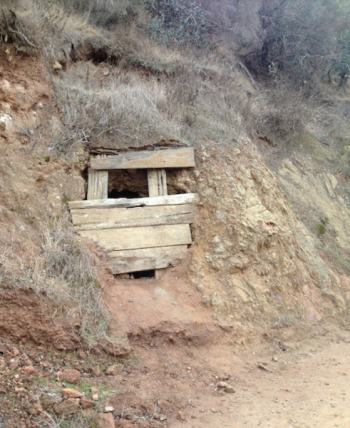 This encloses a small salina which is the habitat of many interesting species. The pebble beach is richly clothed with Pterostegia drymarioides.” [Millspaugh & Nuttall Flora of Santa Catalina Island (1923)].